GBP is moving within an upward trend against USD. The GBP/USD pair trades within a wide channel and tends to the lower limit of the range. On Wednesday, the price rebounded from the lower border of the channel and quickly went up due to the news that the interest rate was kept at the previous level, and the number of possible changes in monetary policy of this year decreased. However, yesterday it became clear that there would be no reversal, and the instrument regained all the losses due to the strong US labor market data. Today, the downward momentum maintained, supported by the fall in demand for GBP and EUR and the transfer of assets to USD. On Friday, there is no key the US releases expected, so the current trend will continue until the end of the day. 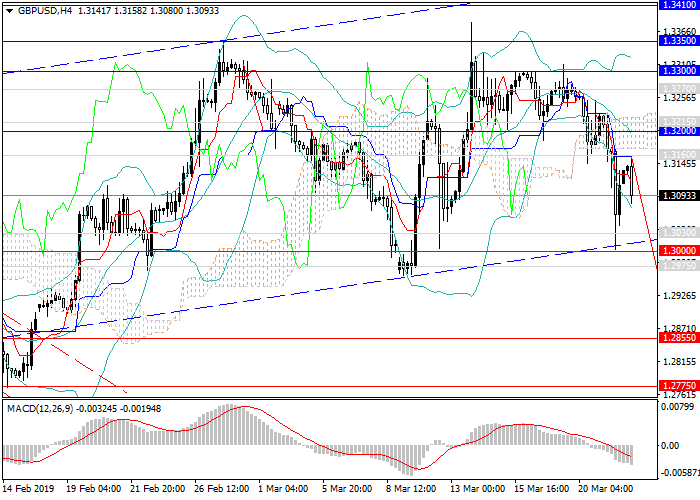 In the short term, the pair is expected to fall to Wednesday’s minimum and the lower border of the channel at 1.3000. In the future, the rate may leave the upward trend due to tension associated with Brexit. If it will be postponed till June, as the UK wants, the pair would not seriously change its position. However, if the EU manages to make its own changes and postpone Brexit for a longer period, GBP may decrease significantly to historic lows around 1.2400. Technical indicators confirm the decline forecast: the volumes of MACD short positions are growing, Bollinger bands reversed downwards. Resistance levels: 1.3160, 1.3200, 1.3215, 1.3300, 1.3350. Support levels: 1.3030, 1.3000, 1.2975, 1.2950, ​​1.2900, 1.2870, 1.2775, 1.2650, 1.2500, 1.2400. It is relevant to increase the volumes of short positions from the current level with the target at 1.2775 and stop loss 1.3240.